THE Department for Social Development and Housing Executive have been accused of relying on inaccurate housing data to mask the true levels of Catholic inequality in north Belfast, according to a new report published this morning. The ‘Equality Can’t Wait’ report, compiled by the Participation and Practice of Rights (PPR) group, states that the Department for Social Development (DSD) and Northern Ireland Housing Executive (NIHE) have been responsible for a catalogue of failed strategies and missed opportunities to tackle housing inequality in north Belfast over the last decade. However the report claims that the statutory agencies are now using inaccurate data statistics to monitor homelessness in north Belfast which downplay the true scale of Catholic homelessness. In 2000 NIHE launched a seven year £133m strategy to tackle religious inequality in housing in north Belfast. Traditionally Catholics have accounted for the majority of homelessness in north Belfast while housing requirements in the Protestant community have tended to relate to the need for improved housing conditions. The NIHE strategy was designed to meet housing need by building 1,750 new homes, bringing long-term vacant stock back into use as well as improving existing poor housing conditions. However PPR states that two separate independent reports, published in 2005 and 2006, concluding that the strategy was failing to address the homeless need of Catholics in north Belfast, were ignored by NIHE and DSD. The PPR report claims that a new NIHE method of monitoring homeless figures in north Belfast actually masks the true religious inequality within the statistics. However PPR claims that NIHE’s decision to only use ‘self reported’ statistics since 2010 has led to a distortion of the true figures for those on the housing waiting list. Analysis of the ‘perceived’ religious figures indicate that Catholics make up 73% on the housing waiting list while Protestants account for 27%. However contrasting analysis of the ‘self-reported’ figures, which NIHE adopted in 2010, state that Catholics account for 57% on the housing waiting list while Protestants account for 20%. In contrast, when PPR used its own ‘proxy’ indicator (usually a post code) to calculate the current religious composition of the housing waiting list in north Belfast, Catholics actually accounted for 76% in housing stress while Protestants accounted for 22%. The report says it is unclear if NIHE continues to collect `perceived’ religious figures, as religious inequality statistics are no longer published in its annual North Belfast Housing Strategy Progress Reports. Based on PPR’s estimations, Catholics represent 76% of all those in housing stress in north Belfast. In contrast NIHE figures which contain ‘self-reported’ religious background present a different analysis, presenting Catholics as representing 46% of total housing stress. In 2008 the Housing Executive adopted new changes as to how it determines where new homes should be built throughout Northern Ireland. However the PPR report has raised concerns over the statistical accuracy of NIHE’s analytical approach. The PPR report claims this new method of assessment signalled an “important shift” in the way in which NIHE measures housing need. “Using the established ‘mean’ average, the NIHE data showed that in north Belfast, Catholics in housing stress waited an average of 23.4 months on the waiting list before being housed, and Protestants waited 12.5 months, as of March 2008. 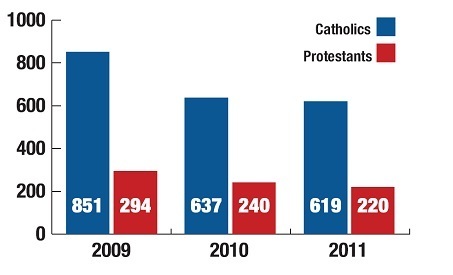 The new way of calculating, which moves from ‘mean’ to ‘median’ average, will change the data for March 2008 to show figures of 16 months for Catholics and 7 months for Protestants. The report claims that current NIHE and DSD policy decisions look set to redefine housing need and jeopardise the fundamental principle of equality of need which the NIHE was established to address. “Of key concern to PPR is the proposal to review the housing allocations policy which is currently premised upon allocation on the basis of need and instead to examine the potential to address other priorities such as ‘social mobility and creating a shared future’. “All the signs indicate that a housing agenda that circumvents religious equality issues is progressing rapidly. Calling for DSD minister Nelson McCausland to take urgent action to address issue, PPR spokeswoman Kate Ward said: “The festering sore of religious inequality in housing must become a priority for the Minister for Social Development, and more widely the Northern Ireland Executive. The spokesman said that DSD, through NIHE, had invested more than £358m in north Belfast, with £222m spent on new build housing since 2001. The DSD spokesman said that the Northern Ireland Housing Strategy, recently launched by Mr McCausland outlined a number of initiatives which will impact on the future for housing across Northern Ireland for the years ahead. An NIHE spokesman said it would study the PPR report in detail before making comment.